I think my latest pattern might be my geekiest yet. 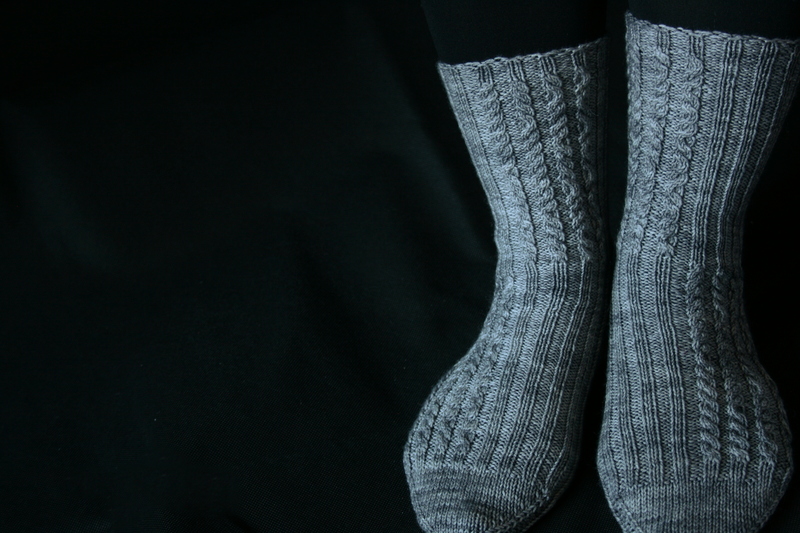 Gray Code Socks have a cabled pattern based on a sequence in binary code and the pattern is available free if you sign up to my newsletter. With four binary bits, there are sixteen unique combinations that you can make. A Gray code, named after Frank Gray, cycles through each possibility only once and each binary word is only one bit different from the previous one. It has many uses in electronics, as well as making cool socks. The most common Gray code is a reflected binary code where each column of bits has a number of zeros followed by the same number of ones, and then repeats the sequence in reverse. 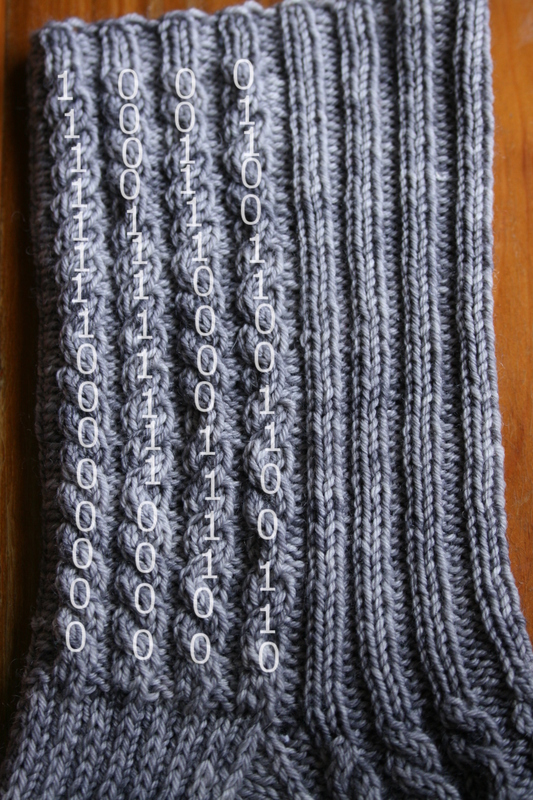 Binary code is normally formed from zeroes and ones, in Gray Code Socks I’ve used left and right cables instead. This makes the bit change between rounds visible as a cable changing direction. The full 16 combination cycle fits well onto the leg of the sock. The socks are top down with a flap and gusset heel. The pattern contains three sizes, to fit 7.5 (8.5, 9.5)”/19 (21.5, 24) cm circumference, and has written and charted instructions, whichever you find easier to use. The cable pattern is subtle enough that people who normally insist on plain and boring to knit socks might be persuaded to try it, especially if they have a geeky background. If you have particularly short feet, you may find that you cannot fit the whole cable sequence on the foot. Because they are made top down, you can measure how long the cable pattern is on the leg and make a decision at the heel as to what to do. If it will bother you, you could just make the foot ribbed. 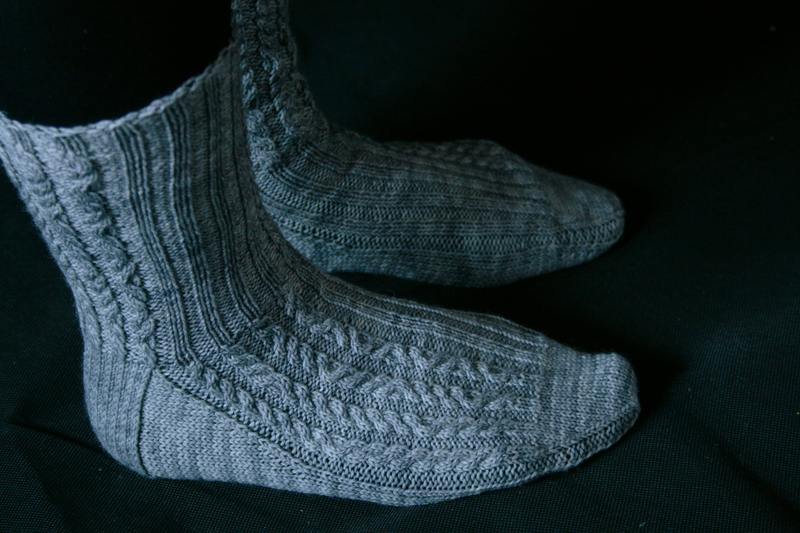 The socks are available from Ravelry, where you can find more information, or if you sign up to my newsletter you will get a code to download the pattern for free. You can choose whether you want to receive my monthly roundup of what I’ve been up to, interesting things I’ve found in the knitterly community or the wider world, a knitting tip and my pattern of the month; or you can just get a newsletter when I have a new pattern or special deal available.